The best concealed carry positions are rather subjective, as each has their own pros and cons. There's more than one way to skin a cat, so to speak, and really the best is what's going to work for the individual in question. 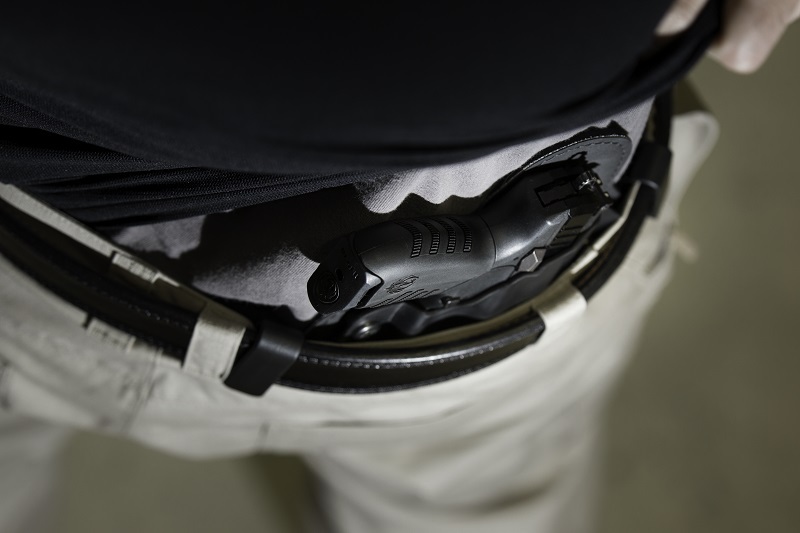 The most popular concealed carry positions are on the waistband, because waistband carrying tends to work better than carrying positions like pocket, ankle or shoulder carrying. Hence, most people carry on the waistband and a plethora of carrying implements are made for doing so, including a host of holsters and a bevy of leather ccw belts. The classic carrying position is on the hip, also called the 3 O'Clock position. It's the most versatile, as it works both for open carry and concealed carry. 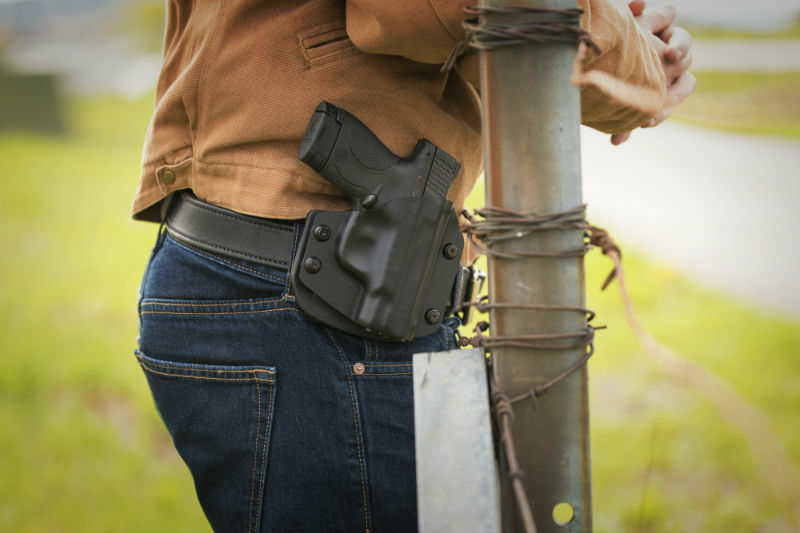 Concealed carriers can easily conceal by wearing an untucked shirt or some sort of outer garment like a sweater or flannel shirt. Or, if one has an appropriate holster for doing so, a pistol and holster can be tucked under a shirt as well. Printing generally isn't a problem, though pistols with longer grips can become quite obvious. Carrying a full-size pistol in this position will result in more printing for the thinner or smaller among us; those with a bit more padding can more easily conceal a full-size pistol this way. Accessing one's pistol is fairly easy, since it's right on the hip. However, there are a few drawbacks. Some may experience the odd dig of a hammer into one's side while sitting down, some may not; a holster with a hammer guard will counter this problem. A person can sit comfortably with a pistol carried in this manner, but a seated draw is problematic at best. Thus, many who carry on the hip - open or concealed - carry with an FBI cant to counteract the seated draw problem. Appendix carry, where a person carries close to the 2 O'Clock position (around where the front pocket is located) has a lot of fans as well, and is becoming very popular as a carry position. With appendix carry, one can employ a strong-side or cross-draw. An added benefit is that to draw, the elbow motion required won't "telegraph" as strongly, giving more of a tactical advantage. However, there are a few drawbacks. Firstly, appendix carry is not the easiest on those carrying a bit of weight, since it puts a pistol on the front of one's belt. Second, it points the pistol directly at one's leg and/or feet; a negative cant will point the barrel at some very sensitive parts. Sitting will also dig the pistol directly into the abdomen, so repositioning before sitting may be required. Appendix carrying is also not the most conducive to carrying a full-size pistol, as a larger gun will print more easily than a subcompact. A slim, sleek compact pistol will easily conceal in this position however. 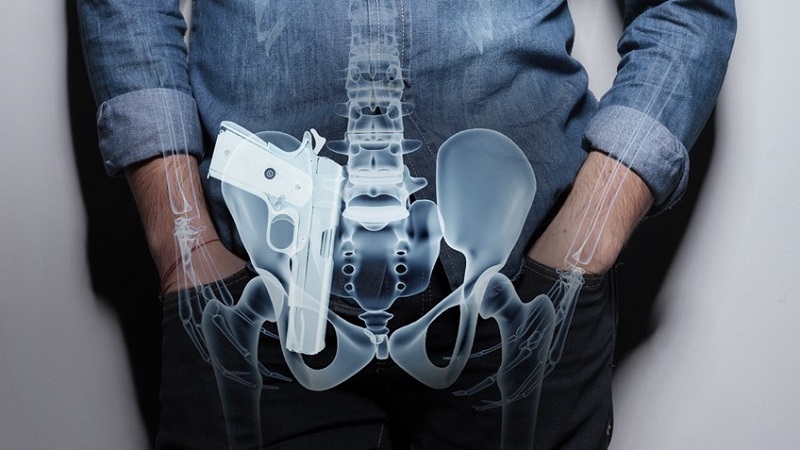 Kidney carry locates a pistol on the waistband somewhere between the 4 O'Clock and 5 O'Clock positions, between the hip and the small of the back. As with carrying on the hip, concealment and access are both fairly easy, though a positive cant - such as the FBI carry - can make access easier. 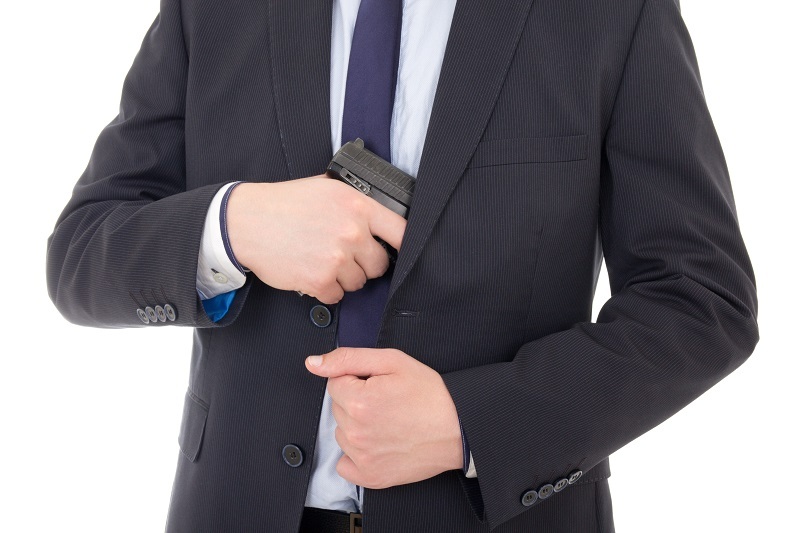 Printing is easily avoided with an untucked shirt or outer garment, and many who carry while wearing professional clothing can easily tuck their shirt over their holster and pistol in this position. However, printing while sitting can occur.. Drawbacks are that the draw is not quite as easy as the hip or appendix positions, though is still very manageable. Drawing while sitting is much more difficult, as one is practically sitting on one's pistol, and seating will cause the holster to follow the waistband while sitting - the grip will be almost parallel to your chair. Small of the back carry is one of the most easily concealed carrying positions. Covering is easy and printing is minimal, as one's pistol lays more or less flat across the back, though a bit of printing will occur if one tucks one's shirt over the pistol and holster when one sits down. Drawing is slightly more awkward than from the hip but is manageable, especially if the pistol grip is facing the strong side for easier drawing. A negative cant will make drawing even easier - some belt-slide holsters for the small of the back can hold a pistol at a 0-degree angle, with the barrel parallel to the ground. However, sitting can get a bit weird, as you will sit on your pistol unless you sit on a yoga ball or stool instead of a chair. Drawing while seated is incredibly awkward if not impossible. So there you have it - the most popular waistband concealed carry positions. Happy carrying.